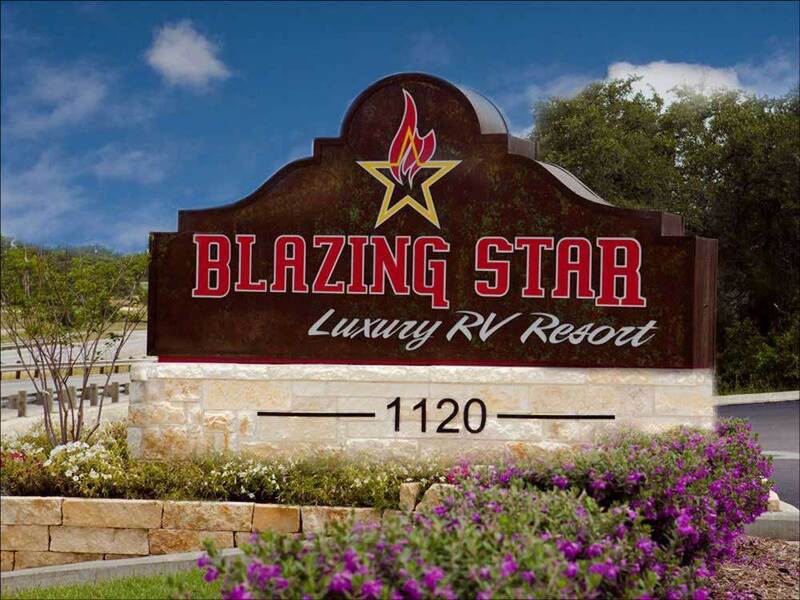 Blazing Star Luxury RV Resort offers terrific location and luxury amenities for your RV vacation. Kick back in our beautiful 8,000 sq. ft. clubhouse, relax at the lagoon pool or enjoy a poolside game of ping pong! Would give a higher rating except the park has gotten worse. Rates have gone up almost to the point of being uncompetitive. People taking their pets to do their business in other spaces. WiFi is run by TenGo, which knows nothing of the frustrations of RV internet connections. They run it with an IT perspective bouncing residents from one access point to another and charging a premium just to double the speed to 3Mbps. Next time I come back to San Antonio, I am seriously considering another park. Can NOT get any work done here. It has got to be one of the worse wifi connections of any park I've stayed at. We stayed in our 40' coach pulling a pickup. Site was concrete pad and was long enough but not very level although it was a pull through. Bathrooms were clean and private but were closed from 9:00 PM to 8:00 AM! Not sure why they had to be closed until 8:00 AM but travelers like us are early risers and that was not convenient. Park was quiet and dog park was clean and had separate areas for large and small dogs. Park is close to many attractions and several restaurants nearby. Will stay there again. When I check in the first space I was assigned was already was occupied. So I had to return to the office for another space. Rather than having a hot tub for adults they opted for a kids pool. The swimming pool is very small and full of kids. They need to have the long term guest tidy up their sites, most of them are very unkept and cluttered. It looks like a white thrash trailer park. I never found the community BBQ grill. The concrete pads are very narrow, with steep drop offs making difficult to get in and out of your parking space. My sewage dump receiver was up hill from my motor home, so when I got ready to drag up I had to go to another space to dump my system. Check out time is 11:00 AM rather than noon like other RV parks. After packing up my gear outside, when I got back inside I noticed that I had missed a phone call. It was from the park manager saying she noticed I was still in my spot past 11:00 AM and wanted to know if I was stay another night. What, really after what I had exsperance when I check in late in the afternoon and found someone in the space I was assigned, really! I was near the front entrance to the park and I was not disturb by any traffic noise on FM 1604. I would highly recommend the fresh Blueberry Pancakes at Jim's 24 hour restaurants, they are located all around SA. The RV park had concrete pull through pads and ashpalt roads with trees for shade (no mud!). The park was clean, quiet and had nice private bathrooms/showers. The staff was friendly. Road noise from Hwy. 1604 was minimal. All residents were friendly though a large number were permanent which was not to our liking. Office Staff are very nice. Almost all sites are nice level pull through sites. Shaded sites are available. Onsite Propane filling. Laundry building is nice. Nice pool area, fitness room, playground. Nice community center area in main building, complete with kitchen for hosting events. Dog park is very nice. Store is very weak on provisions. WiFi, this trip worked fine (previous trip..not so much). Quite a few long term folks here at this location. I would be remiss if I didnt mention some of the pitfalls. The first being..the entire local area is under construction, what a mess...its been like this for two or three years, this year the dirt and filth was noticeable. The second issue I noticed was the water in this area is atrocious, it is so hard, you could say its filthy...definately double and triple filter this water if youre going to drink it. I washed my windows, they were dirtier after the wash than before..horrible. The third issue was access to the restrooms. restrooms do NOT open until 8:00am and they close at 9:00pm!!! This is very inconvenient to those who want an early start to the day. They recently had issues with vandals/homeless folks and the bathrooms, so this is a temporary measure until they can figure out a better solution...I would require a key entry that does not "unlock the door" permanently, but just for the person holding the key and it springs locked when key is removed. Each site could be issued one on check in...or like hotels use card access, when door is closed its always locked...this needs to get fixed. The fourth is the highway noise at the front of the park. 1604 Loop is such a busy road, that road noise only quiets down after about 2:00am and restarts at about 5:00am for morning commute...its a noisy place with squealing tires, sirens, loud exhausts...so dont think of serenity at this location, especially at the front of the park (mid to back of the park is quieter)...think go-go-go...oops... another accident (and there are a lot of them on 1604). So after all the road construction on 1604 gets completed and the bathroom access issue gets corrected...which seems like NEVER, this RV resort will be a much better value.